So, as everyone here already knows, both Operation Rainfall (Xenoblade, The Last Story, and Pandora's Tower) and Operation Moonfall (The Legend of Zelda: Majora's Mask 3D) were huge successes. We're also looking at a Nintendo which is about to release an updated 3DS with all the features we asked for (and more), a port of Xenoblade (a Rainfall game) for the New 3DS, and they are jumping full on into DLC territory. I'm getting the feeling that Nintendo just decided to actually listen to its fans to see what we wanted, and we are wholeheartedly eating up everything they are throwing at us with a lot of glee. I am super grateful and excited to see what's next. Operation Dread: Give us a 2D Metroid on either Wii U or 3DS. Hell, if you can, make Iga the head developer. Operation Triforce: Give us a Mario Maker style game set in the Zelda Universe where you can play around with Zelda 1, 2, and 3 and also update its graphics. Either that or make standalone Zelda Maker games for the first three games in the trilogy or at least the first one. Operation Capcom: I would love for Nintendo to buy off Capcom just for the access to all of its properties. What about you guys? What would you like to see? 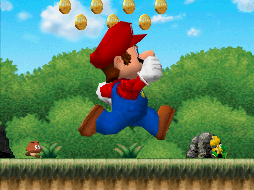 Ambassadors, it's time to earn 100 free coins from your free NES games. Hm, I'm not entirely convinced Operation Moonfall was the thing that got Nintendo to make MM 3D. I think the OoT 3D sales were the main factor; I barely heard of Moonfall and it mostly seemed like a clever way to borrow Rainfall's name at that point. Operation Operation: Get Atlus to make a Trauma Center game for Wii U. Operation stop making Fatal Frame games you refuse to bring to the West. Operation: Kill Region Locking or Operation: Localize Every Game. @TriforceBun Wasn't there a Famicom Disk System game that let you make Zelda 1 dungeons, or am I getting it confused with something else? Sounds like you're thinking of BS Zelda for Super Famicom's Satellaview. I don't think it or any other Zelda contained an edit mode though. I think that's a Penny-Arcade comic. I'd be all over Operation Triforce. There was a fan-made Zelda maker game for PC, but it was unnecessarily complicated and very hard to get into. I would love to have the chance to make a Zelda game, but I wonder how hard it would be to implement the creation tools. Zelda 1 might be too simple to be worth making stuff in. I would prefer having access to aLttP's assets, but they're pretty expansive. The whole process would be much more complicated than something like Mario Maker, where you don't have to tie switches to doors or create interconnected maps. You have to worry about conveyance, pacing, and difficulty in a much deeper way than you would with a simple 2D game like Mario 1. Creating a Zelda Maker would be very difficult, but the end result has so much potential. This. Not that I think these operations have all that big of an impact. Stop making 2D games with ugly 3D models and zero appeal. You HAD to made appealing things in the NES and SNES days because you were limited with what you could work with. Now you have near unlimited processing power (as far as 2D goes) and you resort to stuff like this? What the heck happened? Talk about a step backwards! is actually less appealing than something that came out DECADES ago. I just don't understand why technology has thrown art style out the freaking window in big companies... You STILL do concept art. Just make it LOOK like that concept art! EDIT: I will give credit where it's due, though. Donkey Kong Country on the Wii U looks freaking unbelievable. (But even then, why ONLY Donkey Kong Country and not the-biggest-name-plumber-in-video-games?!?) Rayman looked cool from screens I saw as well, though the fiasco with delaying it to appease MS/Sony made me not pick it up. I guess I'd change it to "Operation: Unlimited MARIO Artstyle" because that's where my biggest beef lies. I agree in concept, but I think only NSMB is guilty of this. 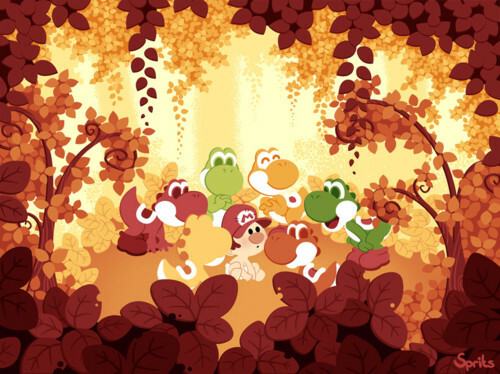 I think Yarn Yoshi--while perhaps not AS artistic as Yoshi's Island--can at least hang out in the same neighborhood with it (maybe play some stickball), and as you mentioned, DKCTF and Rayman have very lovely art styles. 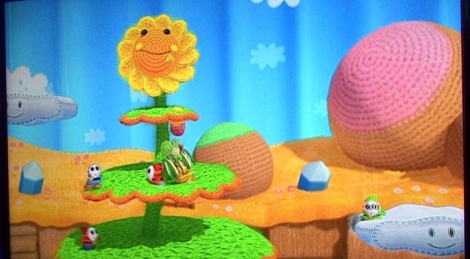 I have to say that, from seeing it firsthand, the new Kirby game on Wii U looks really beautiful too. Wario Land: Shake It too! So I don't really think it's a Nintendo problem so much as a "NSMB" problem. I'd personally love a 2D Mario game that beings the classic Yoichi Kotabe art to life... beautiful, high-res, hand-drawn animation. Also, a game that returns to Subcon. They have been flirting with more and more Mario 2 stuff recently, but I want a full blown return to that world and game design. Not sure what I'd want that'd be universally wanted by all fans. At this point I'd really like to see a Smash Bros RPG. All the characters from Smash going on one huge adventure together. Maybe the Mii is the main character that the whole game revolves around and you go to all the different worlds. Think Mario RPG/Mario and Luigi but with dozens of Nintendo characters. I think I'm getting on board with Nintendo really doing more with their characters. They could basically have their equivalent of what Marvel has done with their movies. If done right, all the Nintendo characters just work so well together. Or I'd like to see Operation Rockfall. Nintendo just makes their own Mega Man game. Or maybe they could get Yacht Club to do it. We should really just pinch Atlus for a slew of Wii U titles. Operation Operation. A video game based on the popular board game. The Fatal Frame thing really is strange, isn't it? Why would they not bring it to North America? The game would probably sell even more copies here than overseas... you know, like that one time when they finally released Xenoblade Chronicles and it sold more copies than in Japan and Europe combined. Not want money? My sister was one of those casual Wii owners, but she always had a thing for the Fatal Frame games... likes horror flicks and photography. When I told her that there was a Fatal Frame for the system that Nintendo was refusing to release, she was equally perplexed and willing to throw $50 at them for a copy. I've never heard of Operation Moonfall, ever. And I am a Nintendo enthusiast. That said, I'm still waiting for Operation Zangeki No Freaking Reginleiv. That reminds me of an idea someone sent to Nintendo Power. It was for a Nintendo Villains RPG. I believe the team consisted of Wario, a Moblin, an Eggplant Wizard, and somebody else. Heck, even a Wario and Waluigi RPG in the style of the Mario and Luigi games would be great.